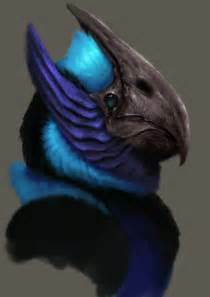 Kocaws are a large, parrot/reptilian creature who live in warm rainforests of the north. They tend to be frugivorous eating berries, mangos and the like, but they also have acquired a taste for flesh and bugs so, keep your wits about you as they may try to bite off your fingers. Kocaws also look odd, as they look a little alien. Male and females have bright blue and reddish feathers and an odd crest that connects to their beak alongside their 'teeth', as well as claws protruding from their feathered forelegs and hinds. So these creatures look more like medium sized feathered reptiles. They are a bit bigger than a wildcat, and weigh 15-25 kg, the males being bigger than the females.